Blend with nature and enjoy the ultimate experience of a camping holiday in the wilderness. Explore the bio-diversity of the Island’s fauna and flora. Enrich your soul and relax to the sounds of nature and wildlife. You will encounter at close quarters birds, elephants, leopards, sloth bear, butterflies, fireflies, waterfalls, cool fresh river water swimming and moments to gaze at the stars as your chef prepares you delicious cuisine in the heart of the jungle. This is luxury camping in the wilderness on an all-inclusive basis serving international spirits, beer, tea and coffee etc., You can experience the comfort of camping in the woods and feel one with nature. On arrival, our representative will meet you at the airport and transfer you to a beach hotel in Negombo. Negombo's colourful culture and heritage including the fishing villages, Portuguese and Dutch period churches and canals will keep you busy if you are up to exploring the town on your own. You will find Negombo an ideal resting place after your long flight. Enjoy the day and the sunshine at the beach. After an early breakfast you will be driven to the world heritage listed Sinharaja rain forest. This tropical evergreen forest has a rich diversity of habitat and endemic species. Your camping site is located in the forest which is bordered by tea plantations. The camp has a serene ambiance about it and you will be able to amble at leisure in the early hours of the morning watching different species of birds and animals. There is a fascinating nature trail in the vicinity of the camp site. The camps are set up with all the amenities before your arrival and in the evening after your afternoon trail you will be treated to a hearty barbecue. There are two types of camping facilities available. You can select which of the two options you prefer prior to your departure. After breakfast leave early morning for a cave exploration. This cave contains 500 million year old stalactites and stalagmites. You will enter through a 100 ft high cave to discover fossils on the walls. There is a stream that occupies nearly half of the cave grounds and there is an 85 foot water fall coming from the top of the cave. You may encounter water monitors, amphibians and lots of bats in this cave. 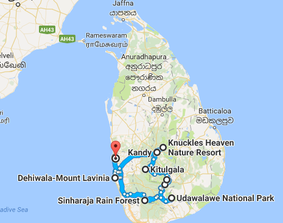 Next we proceed to Udawalawe National Park for a 4WD Wildlife Safari. 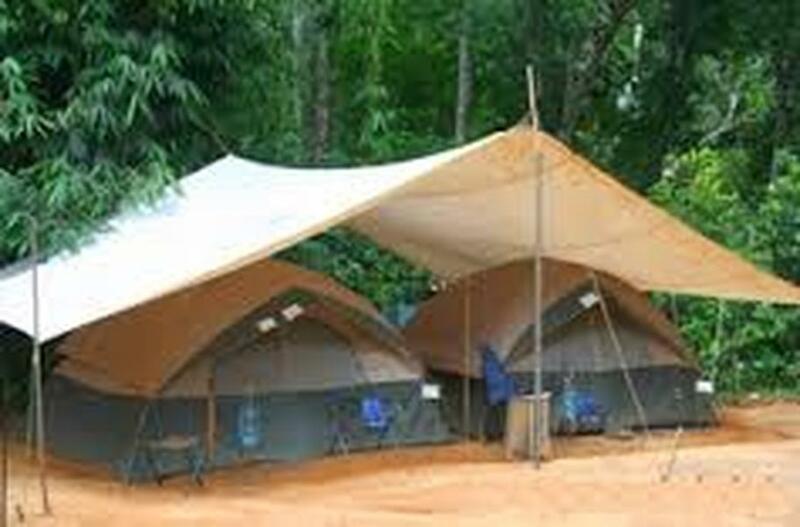 Mahoora standard camping or Mahoora Delux camping is available. After breakfast proceed to Belihul Oya via Duvili Ela. The sheer wilderness and natural reserves will take you through the pristine Eco terrains. The beautiful landscapes, the views and the serene nature of this region will enchant you. This area also links the dry and wet zones and as a result the vegetation in these areas will be ideal for the nature lovers. The dry patina grasslands, the evergreen forests and the picturesque terrain will make you wonder at the thrills that nature offers you. Trekking and nature trails will be worthwhile. Economy camping, standard camping and luxury camping available on site. After breakfast leave for Horton planes gate entrance for a 6 km trekking expedition. Horton plains national park is an eco friendly tourist location. It is undoubtedly the world’s best nature reserve. You can get panoramic views of misty hills and mountain forests and wet montane grasslands. Spanning approximately 10, 000 hectares this park is home to a wide variety of flora and fauna endemic to the region. You should be able to spot mammals such as Elk, deer, giant squirrel, wild boar, wild hare, porcupine and leopard and many migratory birds. The plains also feature popular attractions such as world’s end, Bakers fall and the Chimini Pool. The Horton plains are located on a plateau at an altitude of 2000 meters. If you are a naturalist then this place will be rather interesting. After breakfast leave for Kitulgala for white water rafting on the way to Kandy. We offer you a great experience in white-water rafting. After a Sri Lankan lunch at the rafting centre, we travel to Kandy in the hill Country. Kandy, the last capital of Sri Lanka is a world heritage City surrounded by verdant hills. The name “Kandy” brings into mind visions of splendour and magnificence. Many of the legends, traditions and folklore are still lovingly kept alive. Drive around the Kandy Lake which was built by the last Sinhalese king, Sri Wickrama Rajasinghe in 1798. Visit the Kandy town and Bazaar, the arts and crafts centre, a gem museum and a lapidary. Visit the Temple of the Tooth Relic in the evening and attend a beautiful cultural show culminating with a fire-walking display. After breakfast leave for the Knuckles Mountain range, so called because it resembles a set of knuckles. The Knuckles mountain range is a National Heritage and wilderness area. There are 5 major forest formations in this region. A wide variety of rare endemic flora and fauna are found here. The range offers numerous trails that journey through clear rivers, dense forests, water falls, lush tea plantations and terraced rice fields adjoining Kandyan home gardens. You will have the chance to visit traditional mountain villages in close knit communities. You will be met at Raththota and driven to your camp at Pitiwala village.You will end the day with a sumptuous barbecue dinner after which you are free to gaze at the stars and watch the fireflies flying by. After breakfast full day trekking at Knuckles range. Price is based on 02,04,08 & 10 adults. Prices are net in USD and inclusive of applicable taxes as at date. Rates may change without notice in case of significant currency fluctuation , Fuel increase or Revision of taxes occurs. (Breakfast & Dinner) basis as mentioned in the itinerary). Transportation with a English speaking chauffeur tour Guide. Expenses of personal nature (Telephone calls, Laundry etc.). Mineral water or other beverages throughout the tour.